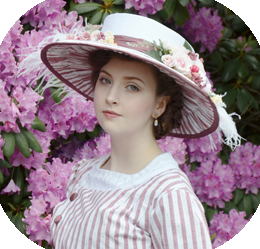 This is a continuation of this post, which goes over drafting and making the bodice of this project. If you haven’t already, I would suggest reading that post first. 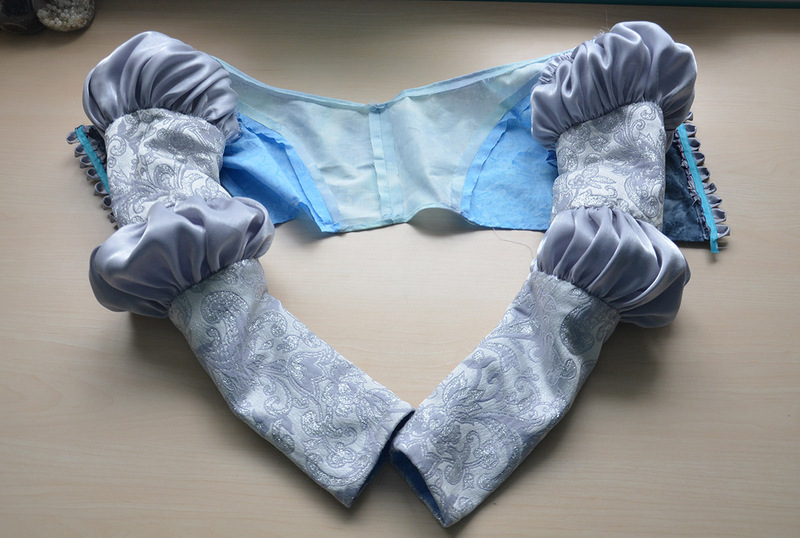 In this post I will talk about making the sleeves! 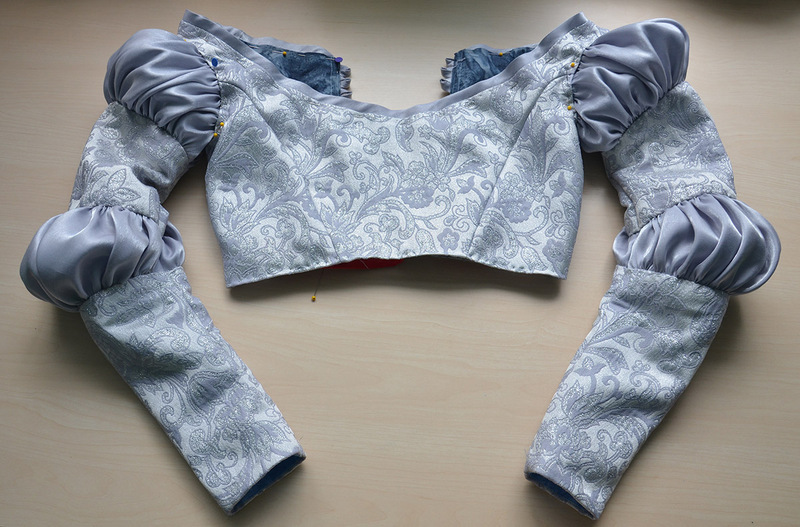 The design for these sleeves is one i’ve used before – a large puff at the shoulder, fitted to the elbow, another large puff at the elbow, and fitted to the wrist. It can easily be made as a four piece pattern. The difficult places to fit sleeves are at the shoulder and elbow, so it is actually really great pattern if you find sleeves hard. The sleeves on this dress bring back memories of making my Merida cosplay a couple years ago. I was really proud of the sleeves on that dress….even though the edges of the chiffon were unfinished and the sleeves were unlined so it frayed everywhere. 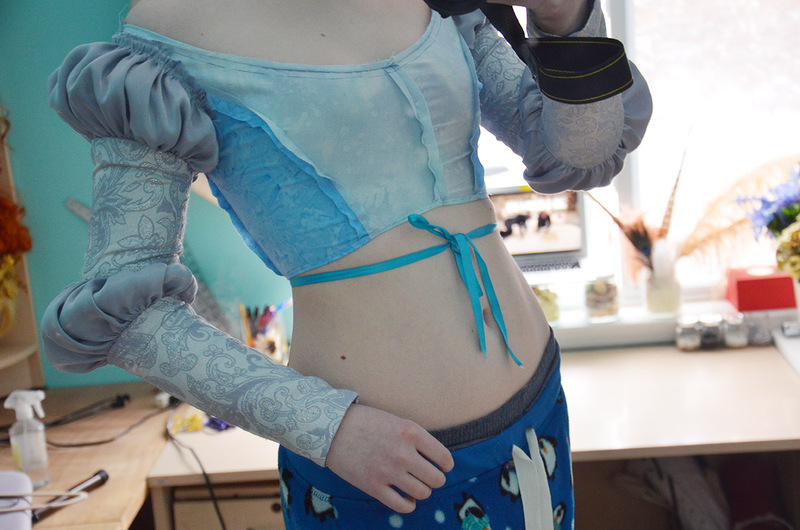 The sleeves also didn’t really line up – and by that I mean the “puffs” were an inch away from lining up at points. Yikes. But I did a much better job this time! I started by taking a set of measurements, mostly paying attention to the arm length. After I got the proportions and shapes right I took this pattern in to fit my arms width. The pieces for the “puffs” were altered a lot. Since I wanted them to have a lot of volume I made the patterns almost four times wider than the size they will be when gathered! The lining for the puffs were cut out of silk organza, I had long scraps of it and thought it would create more volume than thin cotton. 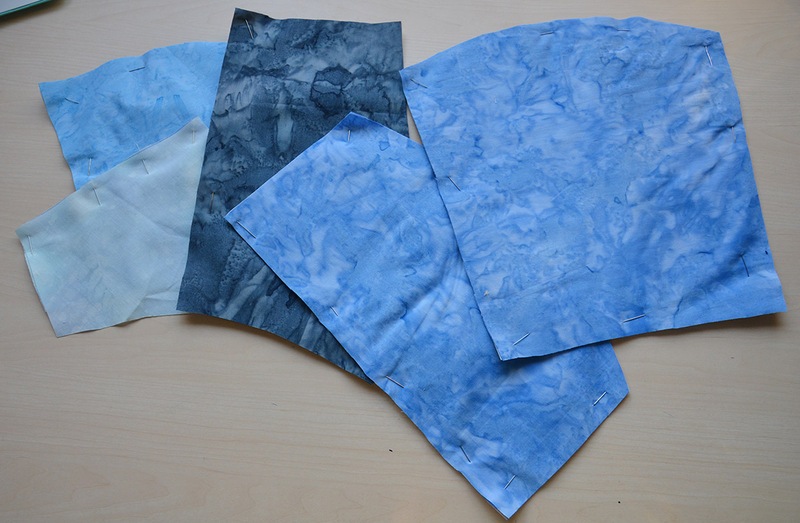 I cut the rest of my pattern from mismatched batiks, the same type I used for the bodice lining. 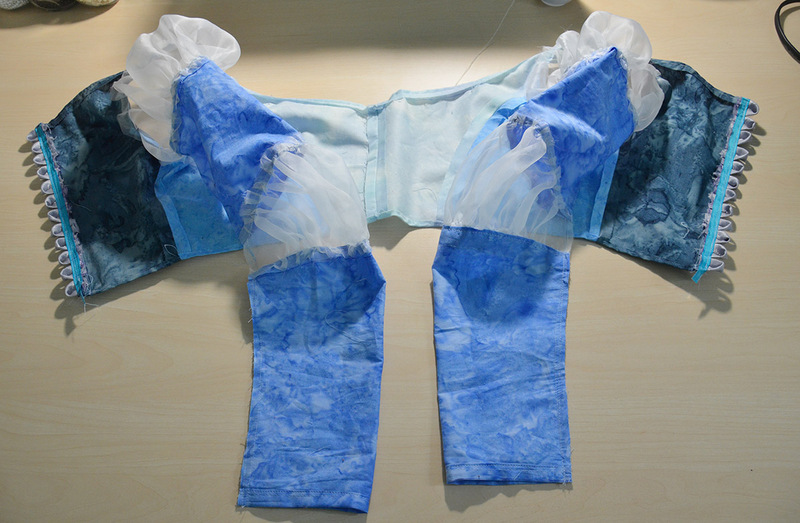 The organza pieces were gathered down roughly by machine, then stitched on to the batik pieces. All the edges were turned over and stitched down to ensure they wouldn’t fray too much. 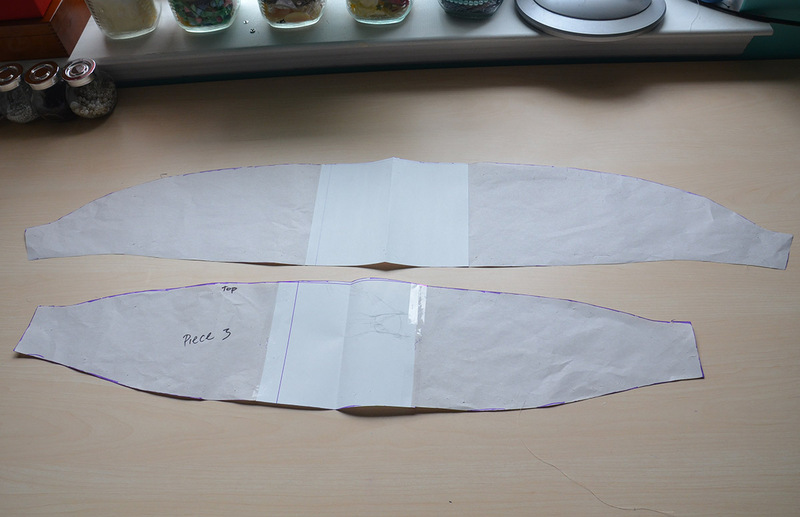 I also stitched up the back seam and tried them on to make sure the fit was good – they ended up being a little large, so I made some alterations to my paper pattern before cutting out the top layer of fabric. I trimmed the edges to be a half inch and then sewed them onto the bodice. I ended up with a big ugly mess that looked like this! But it fit really well, and that is the important thing! So I moved on to making the top layer of sleeves. Step one was cutting out the pattern, again. This time from brocade (the fitted portions of the pattern) and the mystery fabric i’m using for the skirt (for the puffs). Once the pieces were cut out I folded all the edges over a half inch and stitched them down. 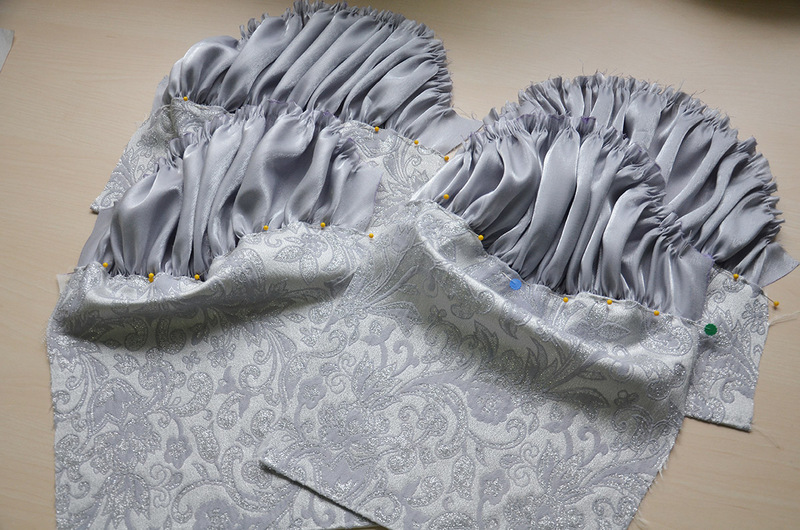 I was concerned they would fray and wanted to add a bit of stiffness to the brocade, so I fused one inch strips of interfacing over all the raw edges. 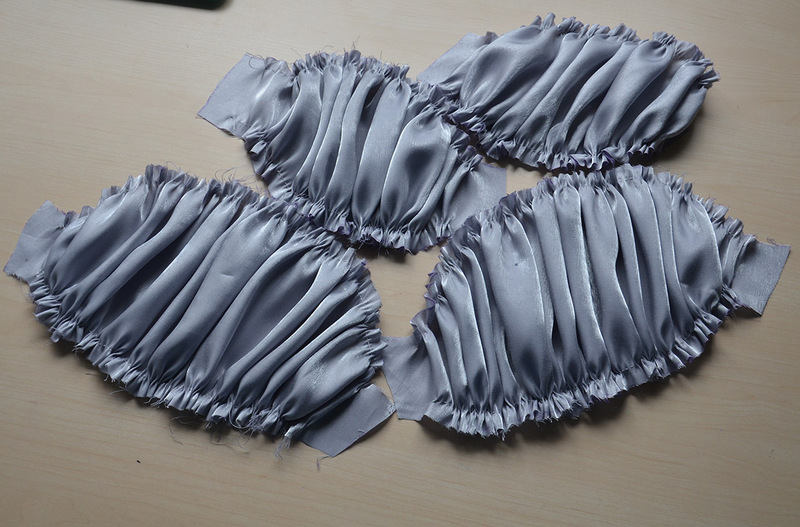 Unfortunately I can’t find a picture of the fabric for the puffs ungathered, but here is what they looked like after I painstakingly gathered each one by hand. It took a long time. Much longer than I was expecting. I may have even done it by machine if I knew how tedious it would end up being. 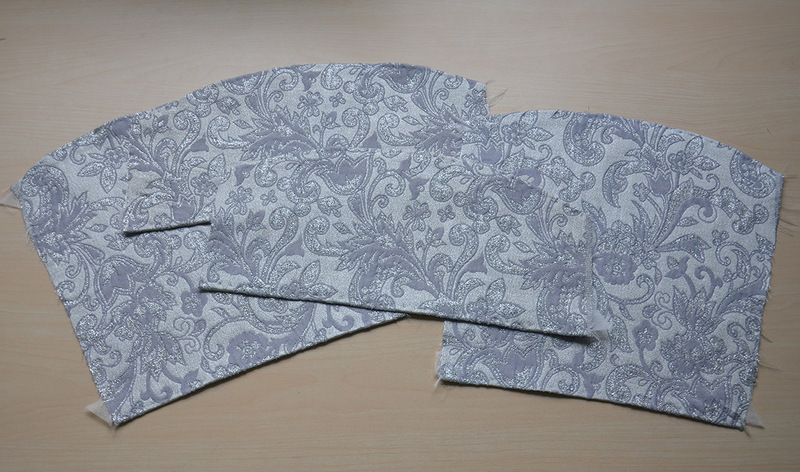 I smoothed out the gathers a little bit, then pinned them onto the brocade parts of the sleeve. Then they were stitched together! This part so it took a long time too. But eventually I had two lovely sleeves! I did up the side seams and they fit nicely! 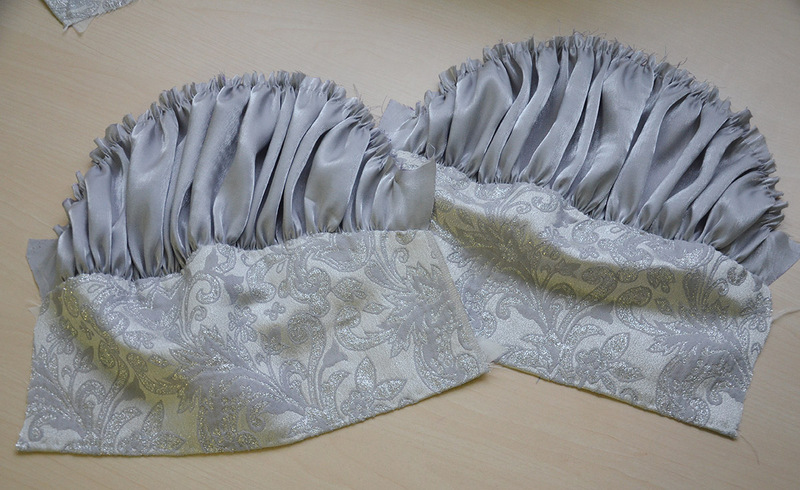 So I sewed them onto the bodice and stitched the cuffs to the cotton lining. Now it was time for another fitting, which went quite well! A few little puckers from the lining not being arranged properly, but that can be smoothed out later. Before moving on to the next step I decided to stitch flannel into the bottom of the lining. Batik is pretty delicate, and so is brocade, neither are really strong enough to support the skirt. Eventually I’ll stitch the skirt onto the flannel and then cover the flannel with brocade. 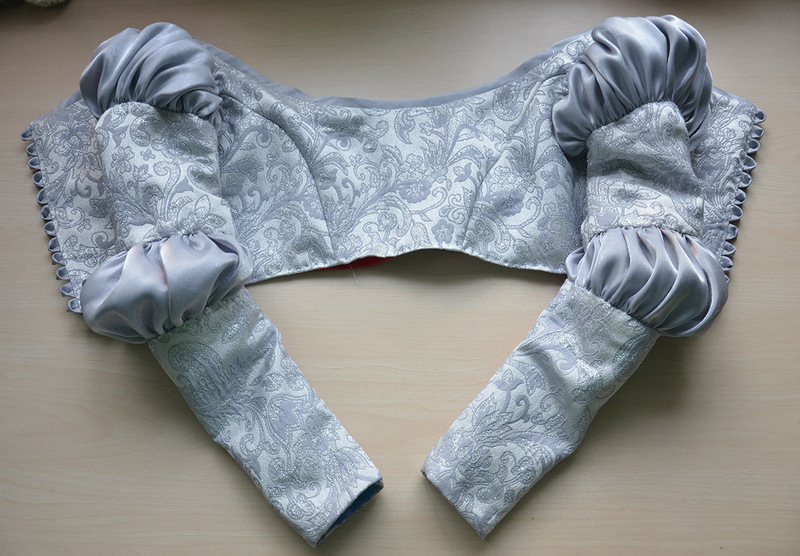 Now I could attach the brocade bodice! Here it is pinned in place. And all stitched down! I left it open at the bottom so the skirt can be attached. That is it for this post! 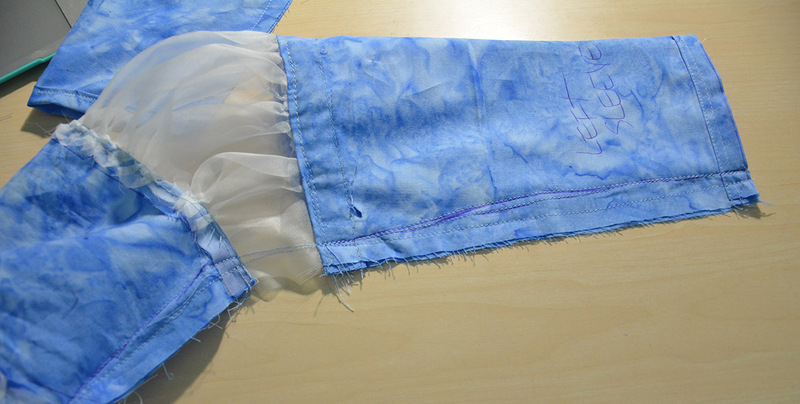 The next post will be the final installment about this project and talk about making the skirt. Forget about fussing with the skirt those fuzzy penguin pants are perfect !! As always I’m stunned by your attention to detail and ability to drafts patterns. Haha, those pants are the best! They shed blue lint on everything they touch but it’s totally worth it because they are so soft and warm. Best $10 spent at walmart, ever. The sleeves are beautiful! I love the “puffs” at the elbows and shoulders. It all looks very regal! 🙂 I can’t wait to see the rest of it! Thank you! The little puffs are a favorite of mine as well. This project is coming along so beautifully! It is just stunning already!! I really dislike blue, but this is gorgeous!! I am so in love with it already! Absolutely incredible! Thank you! I don’t think i’ve ever heard of someone disliking the color blue haha, but i’m glad you like how it’s coming out! I love your work!! I don’t want to bother you, but where did you learn to do those INCREDIBLE puffs, I always try to make them and I don’t get your “results”, so I am really interested on knowing where you learn. Keep on doing costumes because you are REALLY talented!